There are so many things to do and places to explore in San Diego. And, the great thing about the second largest city in California is that if offers a mild climate to enjoy the sights and scenery year round. San Diego is a coastal city located just north of the Mexican/ American border. Blessed with sunshine throughout most of the year, visitors to San Diego hotels can stay beachside, dockside, in the city, or in historic districts while basking in pure California fun! The winter months will find your best prices and fewer crowds at the attractions. You may have to pack a sweatshirt during but you still find many wearing shorts, because the weather is still mild, just a bit cloudy and wet at times. Magic Savings Tip: Research online ahead of your visit to San Diego for discounts on most attractions. If traveling with as a family, you can certainly save big bucks at Zoo, amusements and even restaurants. Take the ferry over to Coronado Island, and rent a bike. While there, visit the Hotel Del Coronado, a beautiful old Victorian style massive hotel. Enjoy dinner, buffet or a cocktail, at sunset on the outside deck. Bring your camera. While in San Diego, actually eat at a real Mexican restaurant and experience real Mexican cuisine. Walk the shops at Seaport Village. Spend a day with the animals at the San Diego Zoo, with the baby Panda, and 100’s of exotic animals. This is truly a fantastic zoo and experience. If you have time and a car, visit the outdoor Wild Animal park experience, where the animals run free. If you make advance reservations, you can get private tours in the acreage “enclosures”. Another fun time is a journey on the “hop on, hop off” Trolley Tour. Although there are a multitude of other fun things to do here, a visit and tour of the U.S.S. Midway parked at the dock downtown is a must do. Enjoy this while you stroll the boardwalk and marinas. Keep an eye out in the bay, especially in the waters between Coronado Island and San Diego for small rubber Navy crafts, and Navy Seal divers on board. They quite often can be seen doing maneuvers, especially at night. Some of your best dining in San Diego is located downtown in the “Gaslamp Quarter”. Here you find over 100 restaurants, all in the center of town, and a short walk from waterfront hotels. If you have a recommended favorite from your hotel, make reservations early. If not, it’s fun to take a casual walk, and read menus posted out front of each restaurant, until you find the one that makes your tummy growl. For suggestions, awesome burgers at “The Burger Lounge”, best Japanese at “Sushi Bar Nippon”, and fun time at “Field Irish Pub” and “Dicks Last Resort” where you eat on white rolled paper, and are insulted by staff (on purpose). Take a day trip to Temecula Wine Country and visit some of the newest and best southern California wines. A great place to have lunch and sip some excellent wines. Take a drive up the coast to Torrey Pines, Del Mar, Carlsbad, where beaches are inviting and popular. 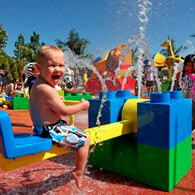 While there maybe take the kids for a surprise day at the new LEGOLAND Theme Park. Some of the best resort-style hotels in San Diego are set in prime locations near the water like the Sheraton San Diego Hotel and Marina. Guests staying here, and in luxury San Diego hotels like the Hilton San Diego Resort are close to shopping, dining, nightlife, and some of the most popular attractions in the city. Many travelers to San Diego love to take the trolley or rapid rail line to Old Town Historic Park, the "birthplace of California," to experience authentic Mexican cuisine, heritage museums, and wonderful arts and culture. Stay downtown for the day and stroll the boutiques and Horton Plaza mall for clothing and souvenirs to take home. You won't want to head back to your San Diego hotel for the night without taking in dinner and maybe dancing in the Gaslamp District, a trendy enclave of streets featuring roof-top nightclubs and charming pubs. Families will no doubt want to visit Balboa Park, were kiddies can ride the Carousel and parents can enjoy a little time at the San Diego Museum of Art. For a special treat, walk the wandering paths of the Japanese Friendship Garden or the halls of the San Diego Air and Space Museum. Why the locals love San Diego! There's a lot to love about San Diego - fresh air, sun, surf and some of the best beaches in Southern California. By what do the locals love about their city? Start dreaming of a wonderful beach vacation right now and find decent accommodation at very good prices so you can make the most of your Southern California trip. The thing that has drawn you - and the thing the locals love - is the sunshine and when you combine that with a pleasant afternoon sipping a local microbrew, well, heaven thy name is this place. It's fast becoming the microbrew capital of the US with new breweries popping up on a regular basis. Combine sun and beer at Coronado Brewing Co, 170 Orange Ave, Coronado. The outdoor patio makes for great people watching or grab a place at the bar during happy hour M-F, 2 to 6. The island itself is well worth a visit and this little treat will put the cream on a grand day out. Over at Amplified Ale Works, 4150 Mission Blvd, inside the California Kebab and Beer Gardens on the top floor of the PB Promenade you'll find an array of cold beers to take your breath away. It's near Tony Roma's and you can sit on the patio and watch the surfers do their stuff on a fabulous beach. Let's assume you've done the big attractions like SeaWorld! What else would a local do? The Little Italy Farmer's Market is in an authentic Italian neighborhood where tuna boats set out from in the early 1920s. It's in the downtown area and good pizza can be had at Filippi's Pizza Grotto when you've worked up an appetite. Taking your nearest and dearest to San Diego? Well aren't you the ideal partner - sweet, attentive and full of ideas about how to set your love life on fire. We'll help you find a great place to stay so you can do all the good stuff - and see the best of the city too. You are, of course, close to some of the best beaches in North America here - for example, Coronado - and a day at the beach is a great way to say aaahhh! Head to Coronado and specifically the sand and picnic area in front of the Hotel Coronado. You can picnic on the beach and then follow up with a cool drink in the hotel's wonderful bar. No romantic interlude is complete without breathtaking scenery and so a visit to La Jolla Cove lets you enjoy one of the prettiest places in California. Stroll the cove area and take in the sweeping views and then repair to the nearby La Jolla shopping and dining area for some retail therapy. Cap off a weekend of romance at a restaurant with a view. Bertrand at Mister A's is in the Banker Hill neighborhood and it's on the 12th floor. Not only do you get a bird's eye view of the city, you get a grand, superb and memorable meal into the bargain. Just a day trip away from the city itself is the little mountain village of Julian. It's about one and a half hours away and it does the whole carriage and mountain views thing very well. What you want to see and do whilst in San Diego will dictate where you stay. See Cheaprooms.com for quality, well-located hotels in most areas of San Diego. 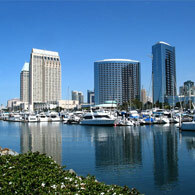 There are hundreds of hotels in San Diego to choose from and all are excellent value for money. If you want nightlife, stay close to the Gaslamp District. If you want museums and the zoo stay close to Balboa Park. There are good deals on Cheap Rooms and especially for weekend stays (when the convention trade slows a little). 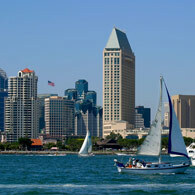 Close to the bay is the Downtown district and where much of the business activity in San Diego takes place. It also has a growing nightlife scene. The Gaslamp Quarter is the site of San Diego's busy nightlife scene - its mix of history and pedestrian-friendly access, concentrated restaurants. Clubs and bars means it's busy every night of the week. The Hillcrest / Balboa Park area is home to one of the largest urban parks in North America. The museums that San Diego is famous for are close by as is the world-famous San Diego Zoo. The Zoo is a huge drawcard for San Diego - as it should be - because of its size and commitment to animal preservation. Old Town and the Mission Valley area is home to the first Spanish settlement in California and the walk-around history of the area is popular with every visitor. Out on the peninsular that surrounds the Bay is the Point Loma Ocean Beach district and it's a largely local enclave with a laid-back beach vibe. One of the best ways to see a city is on foot - but that doesn't suit all cities at night... Do your walking by day and in a warm city like San Diego, you'll be well-rewarded with different sights, plenty of interesting things to do and a new appreciation of a great city. Check Cheaprooms.com for quality hotels to choose from in San Diego. You'll find off season San Diego hotel rooms are great value for family groups. 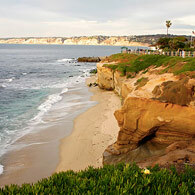 Bring the kids - San Diego offers plenty to see including the world-famous SeaWorld and plenty of green space. Choose a good deal on Cheap Rooms and then base your itinerary around a mix of relaxation and walking tours. If you're staying close to Downtown you're in a perfect area to enjoy the free entertainment at Seaport Village. There are views of the harbor, more than 50 shops and around 15 restaurants. It's a fine place to wander and get the feel of the outdoorsy San Diego vibe. Also close to Downtown is the Gaslamp Quarter with its 16 blocks of historic architecture, fabulous art galleries and fun boutiques. There are plenty of places to stop for a bite and the range of activities means everyone in the family gets to see and do something. Adventuring further afield is easy with the San Diego Go Card. It gets you into to more than 50 parks, museums (with tours thrown in), the zoo and aquarium. If you have young children with you, give them a morning at Boomers Downtown - a hectic house of fun with mini golf, bumper boats and go kart racing. If the weather turns in, get to Balboa Park and visit the Museum of Man; an archaeology, anthropology and sociology museum that showcases human history in fun ways the children will enjoy. Sunny San Diego is such a lovely city to walk around it's a pity more don't do it. There are wonderful walks that will help you discover this great city - and most are within easy starting distance of your hotel. So check Cheaprooms.com for quality hotels to choose from in San Diego. 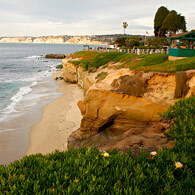 You'll find great value San Diego hotel rooms that are an ideal base to explore the city from. Many claim San Diego has the nation's best weather, so why not get outside and enjoy it? Grab a good deal on Cheap Rooms and see the best of San Diego on foot with its spectacular coastal back drop, sun-drenched-beaches and lively urban downtown area. If your hotel is downtown, start your walking tour in the waterfront area. Begin in the cobble-stoned alleys of Seaport Village and take in the shops, dining and entertainment choices that you might venture out to later that night. Stroll along the marina boardwalk and listen to the gulls, past the Manchester Grand Hyatt San Diego and continue down to the Embarcadero Marina Park for more people-watching fun as the locals do their kite-flying or picnicking. For the more active, there a three mile hike along the boardwalk that connects the Pacific Beach with Mission Beach (both of which are lovely beaches to rest awhile). It's very popular, especially early in the morning so watch out for runners, inline skaters and cyclists. If you like a little history with your walk, head to the Coronado beach community where members of the local historical society will take you on a guided walk past landmarks and the navy base. And if you're really keen, try The Mt. Palomar Observatory Wilderness Path in La Jolla. The newly re-opened park is a glorious - and easy - romp through acres of native plants. Exploring the outdoor escapes in downtown San Diego is an option at any time of year for San Diego. Go to Cheaprooms.com and get yourself to San Diego with a cheap hotel packageto suit your budget and group size needs. There's plenty to see apart from the local bars and restaurants. The heart of San Diego is the vibrant Gaslamp District, where this historic area lights the city up at night. But check the weather forecast for San Diego before you come so you know what you're in for. 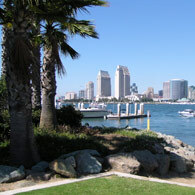 Find somecheap accommodation in San Diego and get ready to enjoy the great outdoors, downtown San Diego style. If you love history, there's plenty of it on display in the Gaslamp District. It has been happily entertaining citizens for more than 150 years and is now a rather special shopping and entertainment drawcard. Find the hidden treasure in the gorgeous Victorian buildings and check out the bars and clubs in the vintage setting. The Gaslamp Quarter after dark is an enticing array of restaurants, bars and clubs. Look out for 207 at the Hard Rock Hotel. Or try the Belo underground nightclub, or Ivy if you're after a decadent, multi-level place that caters for all ages. For some live music in San Diego, your options include the Blarney Stone - an Irish themed pub with live music. Try Croce's for some good food as well as live bands and Henry's Pub for more of a piano bar style of entertainment. The Gaslamp is a good choice if you only have a couple of days in San Diego. There are more than 150 restaurants, clubs, lounges and bars with live music. There are about 80 shops, boutiques and galleries in the area and it's equally during the daylight hours!